All that glitters is due to the optimum utilisation of cutting edge Technology and Machine tools and so much so that technology and latest inventions have transformed the Gems and Jewellery industry globally. Large jewellery corporate have reaped the benefits of technology by expanding and growing to cater to a large International mass. The entry of CACAM software into the jewellery industry changed the perspective of the way jewellery was designed and manufactured. CADCAM till date has its place of pride as every jewellery piece can be designed with geometrical perfection. The gems and jewellery industry has come a long way from the time it forayed into the world market and now more business men are looking at innovating the existing technology, with an aim to improve quality and reduce cost of production. Laser machines and laser heads is the call of the day where companies are making optimum utilization of technology using one laser head in as much as 3 workstations. This truly helps in saving costs and increase production limit. Manufacturers have also started using lost wax investment casting, which allows them to make designs of jewellery with more details but is cheaper as it is lighter. When it comes to Gold too, the fabrication process is mostly machine aided than manual as it helps the manufacturers in mass and light weight jewellery production. As exports grow, jewellery companies irrespective of whether they are in polished or fine have to cater to International standards and a number of Multinational technology companies have forayed into India to offer globally accepted machinery and equipments. This has not only increased production and exports, but also enhanced the quality of products. By and large, the Gems and Jewellery industry in India has been indifferent to the adoption and establishment of formal or informal industry standards. However, as the industry has grown and more and more businesses have started transacting on a global basis, a need has arisen for establishing standards. It is a belief that machines take over Man, but the advent of technology and machinery has proved to generate employment in the country and according to a research report, there is a projected increase in the employment rate in specific segments such as Jewellery Fabrication, Diamond processing, Gemstones and other categories including Retail. It is expected that the Gems and Jewellery industry would have the potential to employ about 8 million persons by 2022. 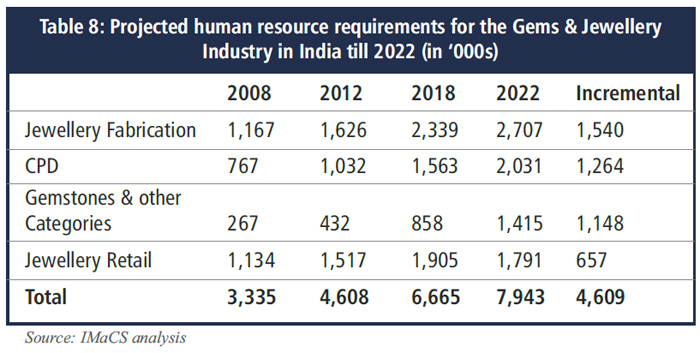 This would mean an incremental human resource requirement of about 4.6 million persons between 2008 and 2022. India has unleashed a wide canvass for domestic as well as International players to compete and this has proven to be a big advantage to the trade as they derive a price advantage out of this competition. With more Multinational companies looking to share space from Germany, Israel, Japan, China etc, Indian technology giants too are not far behind. Though India lacks in technology development, large Indian companies are efficiently distributing high end machinery and tools to the industry. This import and distribution effectively increases the bandwidth for more International companies to increase their market share in India.